Mmm, these bars are so good. I love carrying them around in my bag to be able to eat for a healthy snack. Or breakfast. Or lunch. They’re the best bars I’ve ever tried. KIFA BARS are the BEST! They always give me so much energy! As a busy mom I’m often in a rush at breakfast time, but I know I’ll feel great until lunch if I can grab a bar. They are also perfect before a workout or during a race! All of the flavors I’ve tried are really yummy as well. I’m super impressed! My sister sent my Father some KIFA BARS, and he let me have one–hooked!! Here we are, big time Kifa fans on the summit of Mt. Rainier, elevation 14,411 feet, on July 2015. The mountain took two days to conquer. On the second day our team embarked for the summit at 12 midnight, and reached the top at 6 am, and then arrived back at the trailhead later that evening at 6 pm. An exhausting achievement, and Kifa Bars were an essential part of the trip. 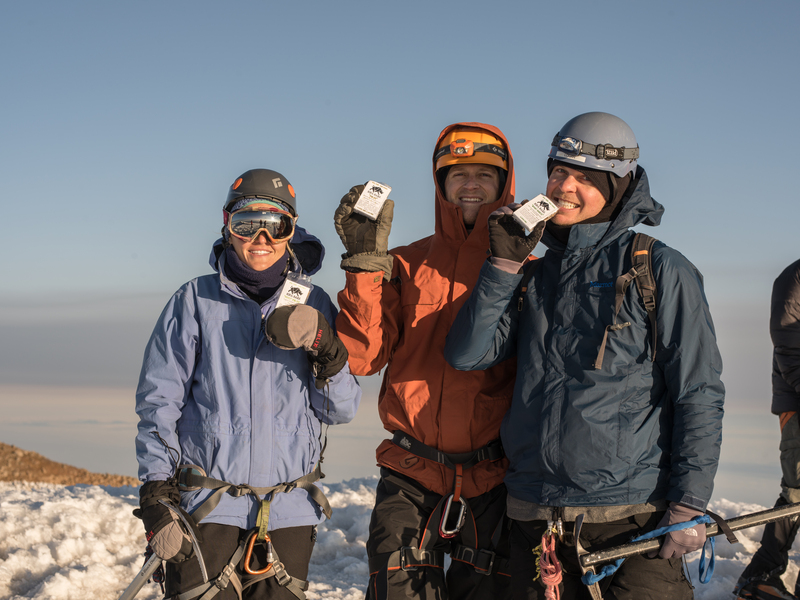 Small and easy to pack, yet full of enough nutrients and energy to sustain our team over glaciers, rock, and crevasses until we reached our goal. Kifa Bars are the perfect companion for adventurers. Where have YOU taken Kifa Bars? I wanted to give my scoop and my testimony of KIFA bars. Top line, they are amazing! So much better than the junk food we eat when we’re on the go, and other energy bars. I don’t even like 99% of the energy bars out there. If you haven’t bought yet, it’s about time to give them a try. These are way better than whatever else you are buying. You feel good after eating them, they satiate your appetite because it’s real food, and they provide energy. Tried them while hiking Mt. Hood, after running, even for breakfast. All good, even on the Hood. You don’t need to run a triathlon to eat these. Yeah, they cost a little more than a candy bar, but this is your body. Eating one of these is like giving a nod to good health for the day. 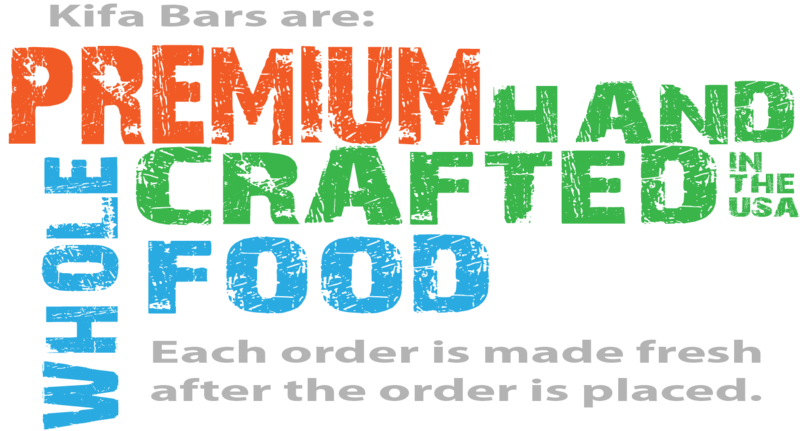 There you have it, the honest truth on these tasty bars. We LOVED the Kifa Bars — they were gone within a day. We will be ordering more! We are eating vegan for health reasons so we love the honey in the bars. Yum. I just ran a 3:36 Marathon and Kifa PALEO fueled me all the way! I have never ran a full marathon or a half marathon without feeling hungry until PALEO came along! As a personal trainer and long distance athlete, PALEO is the ultimate racing breakfast of choice! I was just emailed some photos of the last marathon I ran and was reminded of what helped me feel so great for all 26.2 miles! KIFA PALEO fulled me all the way to a PR of 3:20! KIFA is a super important part of my nutrition plan as an athlete and helps take my training to the next level! I can’t wait to run the Boston Marathon next year with a KIFA in hand! It’s rocket fuel folks! I took one of the bars with me to eat in the car on the way home — it was the best bar I have ever had — we are going to have to get some more — can’t wait to try another favor — tried the Cublamm because I really like cashew — wonderful. I FINALLY found a gluten and dairy free, nutritious, delicious energy bar i can eat!!!! So excited! The owners are so nice and accommodating- I’m always dropping by to get another 20 bars…lol. They are perfect to eat after a workout or between massages- I am a massage therapist. I especially like the Paleo and Jac’d since they are higher protein and lower sugar! So grateful for Kifa Bars!! Thanks for making awesome bars Kifa! I sometimes don’t have time to pack a lunch and I don’t have time to get to the food court between classes. Kifa to the rescue. Kifa bars are way above other bars in every respect- wholesome ingredients and flavor. It’s important to know what your eating and whether it’s good for you. With Kifa I can be assured of both. There are no sketchy fillers like Soy Lecithin that is found in other so-called “healthy” bars. This is clean, healthy and delicious food which comes with me everywhere I travel. Kifa Bars are so delicious, and last a long time too as I recently found out when I came across a few bars in an a backpack I had not used in a while. They looked fine and I wondered if they were still good, so I opened one of the bars and the first thing I noticed was a nice fresh smell. Then I broke a piece off and tasted it and it tasted great! I later learned that I had bought these bars in the summer of 2014, so they are almost a year and half old and still delicious! Kifa Bars are so delicious, and last a long time too as I recently found out when I came across a few bars in an a back pack I had not used in a while. They looked fine and I wondered if they were still good, so I opened one of the bars and the first thing I noticed was a nice fresh smell. Then I broke a piece off and tasted it and it tasted great! I later learned that I had bought these bars in the summer of 2014, so they are almost a year and half old and still delicious!